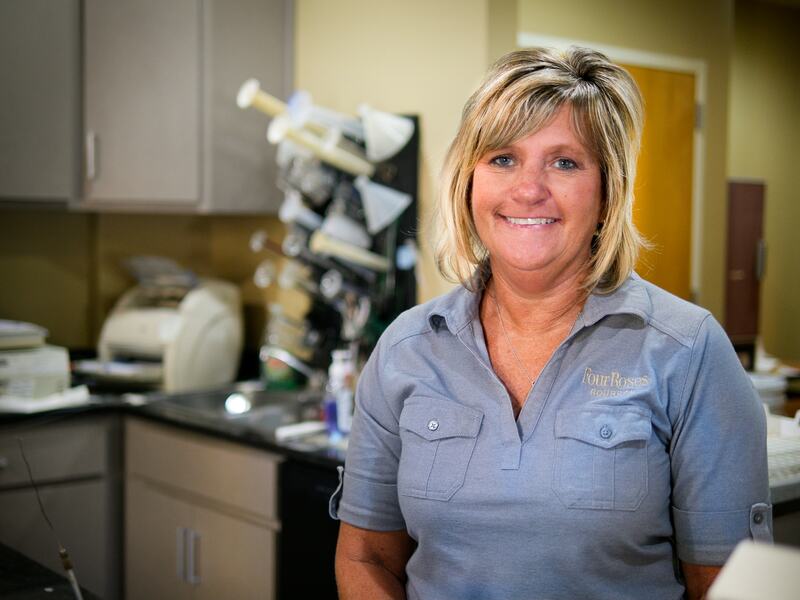 Meet Patti Russell-Rhea, Laboratory Manager at our Distillery in Lawrenceburg, Kentucky. Patti is the keeper and propagator of the 5 strains of yeast and lactic cultures of Four Roses Bourbon. She monitors all phases of the fermentation process through various laboratory testing, checking and determining the analytical yield of each fermenter distillate. 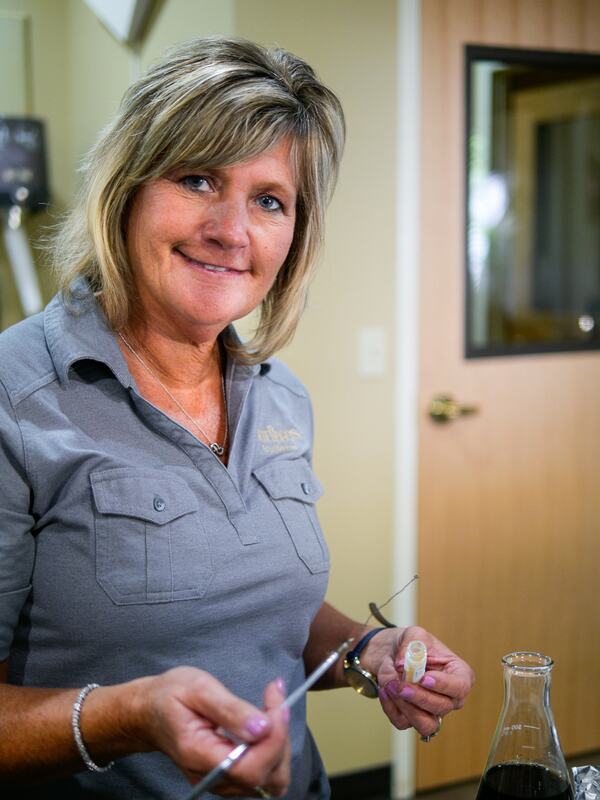 Patti is also a member of the sensory team that evaluates and monitors the quality of Four Roses Bourbon distillates and maturates. We sat down with Patti to talk a bit more about how she has her hand in the process of handcrafting Four Roses Bourbon. How many years have you been with Four Roses Bourbon? Are you originally from Kentucky? Yes, I was born and raised in Frankfort, Kentucky, where I still reside today. What does a typical day at the Distillery look like for you? I spend most of my time on the job testing and monitoring fermentation samples, calibrating the lab instruments in both the Distillery and fermentation labs, calculating alcohol yields and coordinating with the Distillery operators their daily yeasting needs and changes. What is your proudest moment on the job? The opportunity to be hired on at Four Roses Distillery in this role just shortly after graduating college. This has been a very rewarding career path. What is the most valuable lesson you have learned in the role of Distillery Laboratory Manager? I have learned how critical the yeasting process is to the final product. What is the most surprising thing about working at Four Roses Bourbon? The most surprising thing to me is how the increased popularity of Bourbon has multiplied the amount of tourism over the years, not only to our Distillery, but the state of Kentucky as well. A fun fact is that Bourbon is sort of a family affair for me in that Wild Turkey Master Distiller, Jimmy Russell, just happens to be my uncle. My husband, whom I met working here, is the former Four Roses Chief Operating Officer, John Rhea, who recently retired with 40 years of service. When not at work, where can you most likely be found? I am a sports enthusiast and you can most likely find me watching one of my children playing baseball, softball or volleyball. I also play in a weekly volleyball league and occasionally play for the Four Roses softball team. You might also find me at the nearest mall as I love to shop—I call it retail therapy.